Who doesn’t want a fit, toned body? Did you know that exercise alone isn’t enough? Actually, only 20% of weight loss is attributed to exercise. 80% is based on the foods you consume. Your diet plays a huge role in reaching your fitness goals. Should you eat before your workout or after? Are certain foods geared more toward developing lean muscle and others more effective in burning fat? There are many variables that contribute to the way your body builds muscle. When and what to eat are key factors. Let’s take a look at how to eat healthily and reach your goals faster with the right diet! Some of the most important times to eat are before a workout, after a workout and often! Eating often helps maintain an active metabolism and stable blood sugar levels. When you skip meals your metabolism slows down and your body goes into starvation mode, which causes it to cling to stored fat. This is the opposite of what we want! Eating often keeps your metabolism working quickly, burning fat instead of muscle (which can also happen in starvation mode). Consuming small meals every 3 hours is best. Also, make sure to eat breakfast. It truly is the most important meal of the day! Without it, your body will go into instant starvation mode before the day even starts. Try not eating after a specific time at night – 6:00 or 7:00 p.m. – and limit carbs after these times. This is one of the most important ingredients to consider when learning how to eat healthy. Proteins offer many benefits including feeling full longer and helping break down carbohydrates when eaten together. Protein helps your body build and repair tissue. It’s the building block of your bodies bones, muscles, cartilage, skin, and blood. 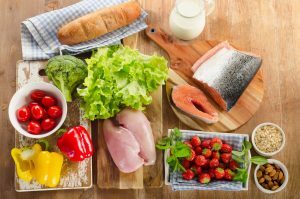 Protein can be found in many foods including lean meats, fish, and eggs. You can also find substantial protein in quinoa and lentils. Before your workout, you should consume foods that help boost your energy. After workouts are for recovery foods rich in nutrients. You should have a small snack about 30-60 minutes prior to your workout. Some great options are a protein shake, yogurt, and nuts or whole wheat toast and fruit. Each of these food combinations will provide you the boost of energy you need to make it through your workout. Just beware of eating too much fruit. It’s good in moderation but it is still a carbohydrate containing sugar. Sugar increases your bodies level of insulin, which you want to keep low. When insulin levels are too high, it slows the down the rate at which your body burns fat. Post-workout meals should be high in protein, which will aid in muscle recovery. These foods include eggs and lean meats like chicken and fish. You can add a dose of healthy fats with some oil or avocado, which may actually help reduce belly fat! Vegetables are another great way to add nutrients to your meal like iron found in kale. Whether you’re looking to tone your body, lose weight or maintain, choosing the right foods and learning how to eat healthy are vital to your success. Foods rich in nutrients consumed at the right times will help you get the results you’re looking for!